The life of a modern day homesteader is consumed with planning and projects. Whether it’s beehive construction, mending broken fence-posts, or stocking the pond, the expense list is perpetually growing. Fortunately, every time our budget tightens, our ingenuity expands. I’m a strong believer in the “do what you can, with what you have, where you are” philosophy. That very attitude served us well in our recent poultry palace construction project here at Wildwood Acres. Reusing, refurbishing, and thinking outside of the box (in this case, the nesting box) was essential for us to be able to build the type of coop our feathered friends require for comfort and convenience. For months prior to tackling this building project, we poured through coop-construction plans online and checked out books from the local library. We consulted with chicken-keeping friends and neighbors, and kept our eyes peeled for affordable used and new coops on websites like Craigslist and community hobby-farm bulletin boards. Everything was either too big to move, too expensive to buy, or too poorly constructed for permanency. We decided it was time to tackle this problem with a little creativity instead. 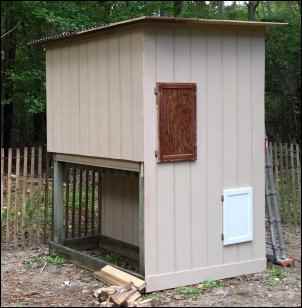 In an effort to spark inspiration regarding ways I could potentially utilize items we already had on hand, I decided to do a general search on the internet for alternative chicken-coop structures built from recycled materials. Who knew that I’d spend the next couple of hours pining through page after page of refurbished chicken-coop endeavors from across the globe? 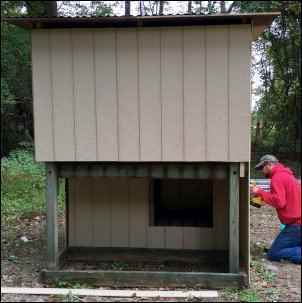 The idea of utilizing recycled materials for housing livestock has not only taken hold in the chicken-keeping community, but has apparently become a passionate movement for many modern-day pioneers. I stumbled upon top bar beehives made from old, wooden feeding-troughs and modified antique china-cabinets being utilized on front porches as fancy hutches for meat rabbits. Hobby farmers are using old pallets to build everything from raised garden beds and lawn furniture to mini barns for their pygmy goats and fencing for their livestock. Old bathroom vanities, kitchen cabinetry, oversized television entertainment centers, plastic Little Tykes play structures, former above-ground pools, and even the steel bones of the family’s old backyard trampolines are being transformed from everyday household items to glorious, functional and funky chicken coops. Granted, not all of the online endeavors I saw were what I would consider to be successful or high quality. After all, it does take skill and know-how to physically build or renovate any type of structure, but for the most part I was pleasantly surprised and incredibly inspired by, not only the ingenuity of the homesteaders, but the quality and structural integrity of the vast majority of their barnyard repurposing projects. Many of the builders put great effort into weather proofing their structures and identifying clever ways to maximize space while building highly purposeful and practical coops. Unique materials were even used for the nesting boxes inside the coops. Plastic storage bins and crates, 5-gallon buckets turned on their sides, and even woven baskets picked up from thrift stores were just some of the items repurposed for comfortable nesting spots, perfect for mama hens to hatch their broods. Reading the stories and looking at the photos of so many exceptional coop construction projects gave us just the right amount of motivation we needed to seek out our own poultry palace possibilities. One day we happened upon a child’s backyard play-gym. 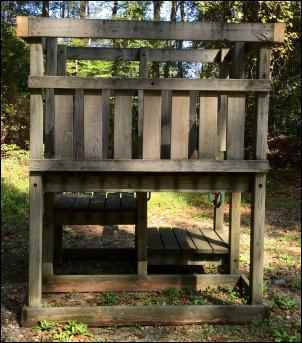 It was constructed entirely of wood and although significantly aged, it was quite structurally sound. Being that the family was older now, it no longer served any purpose for the owners. We decided to make them an offer and much to our surprise, they practically begged us to remove the structure from their backyard. They assured us that if we transported the “hunk of junk” off of their property, then we could have it free of charge. The old saying, “one man’s trash is another man’s treasure” absolutely applies to this situation. The following weekend we began construction on our new coop, which would later come to be known as the Prestigious Poultry Palace. 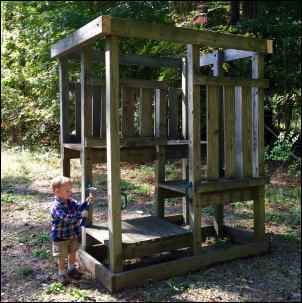 The first order of business was to remove the swings, slides, and protruding pieces of lumber to make the structure more square. We then roughed out a plan for ventilation and three separate entrances and exit points for the birds to come and go with ease. Next, we purchased sheets of hardy plank for the siding and a couple sheets of galvanized steel for the roof. We removed an old section of cupboards from our kitchen last winter and fortunately we saved the doors and hinges. They fit beautifully on the front of the coop. 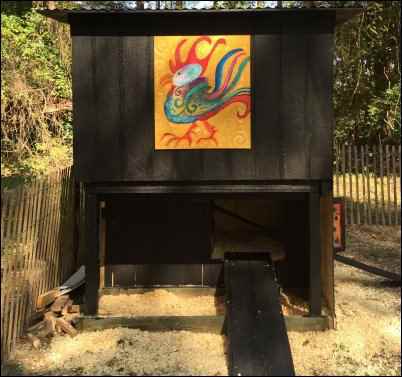 One door is positioned for use as the lower exit, while the other door allows access to the loft section of the coop and is mainly used for cleanings and for adding fresh bedding. Few things bring more joy to the homestead than looking out into the chicken pasture to see our feathered friends peering out of the loft and perched atop the old cupboard doors. Because the bones of the structure were in such good condition, the actual sheeting and roofing process went rather quickly. We finished up the coop in two short weekends of work. Our birds typically free range during the day, but we eventually added a spacious run enclosure to keep them safe during the nighttime hours. Identifying ways to repurpose items you have on hand is extremely satisfying, yet squirreling away a plethora of random items in the hopes that you will find a use for them someday is not particularly practical. I’ve found that if I keep a physical list in my homesteading notebook outlining all of the projects I’d like to accomplish over the year, I can pick and choose items to salvage and seek out over time. The benefits of repurposing items are vast. BUDGET – Salvage your budget with salvaged materials. I’m not afraid to dumpster dive. This doesn’t mean I creep around neighborhood trashcans in the middle of the night seeking out treasures. Okay, so, maybe I’ve done that before, but the point I’m trying to make is that consistently keeping your eyes open in search of thrift-store and “side-of-the-road” finds will ultimately save you money on homestead projects and allow you to get creative in your hobby-farm endeavors. EARTH WISE – There is no denying the fact that it is a wise idea for our earth and our future generations to reduce, reuse, and recycle whenever possible. Not only are we helping to reduce the amount of trash that we put into the belly of our planet, we are setting a good example for children and grandchildren. After all, they are always watching us. CREATIVITY – Committing to a repurpose project forces us to get creative and think outside the box. Reusing items is almost a form of artwork! We must think the project through with logic, but also tap into our imagination and inner creativity to make the project work and come to fruition. INSPIRATION – One of my favorite things in life is to find inspiration in the people and world around me. Whenever we choose to recycle, we are being the change we wish to see in the world and we might just inspire others to do the same. Tackling a project with recycled materials not only makes us feel proud, but it allows us to view the world with a different set of eyes and dream up new possibilities. 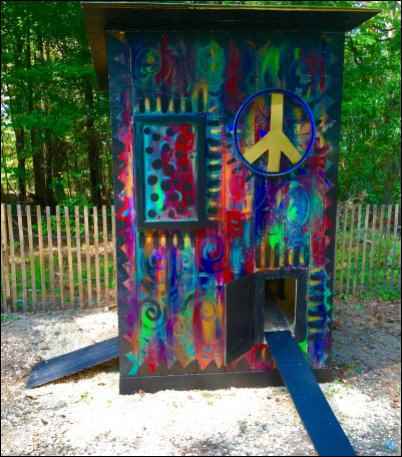 Whether you are building a chicken coop or your dream house, identifying ways to refurbish and repurpose materials can add a generous amount of pride and pleasure to your projects.